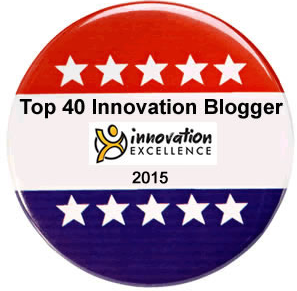 This is part three of a three-parts article co-written with innovation-3‘s Frank Mattes. The first part highlighted that radical and incremental innovation build on two different innovation set-ups (exploration and exploitation, respect. The second part showed in a sample of seven leading firms that ambidexterity is used in two main types – contextual and structural ambidexterity. In this final part, we illustrate that successful ambidexterity requires a well-managed hand-over from the explorative to the exploitative set-up. Furthermore, we also provide some insights and guidance on how this hand-over can be achieved. In the time since we wrote the first part of this article series, an extremely valuable research paper on organizational ambidexterity has been published. In this paper , which is a “must read” for everyone engaged in this topic, Stanford University’s Charles A. O’Reilly and Michael Tushman review and condense the research done so far on the subject. In uncertain business environments, organizational ambidexterity appears to be positively correlated with increased innovation, better financial performance and higher survival rates. In the next major step of our thinking process we want to work why a well-planned and actively managed hand-over from explorative work to the exploitative, formal organization at a pre-defined point within the innovation funnel is necessary. In order to frame this discussion and in order to position the examples from the second part of this article, we will introduce a model of the innovation funnel. But we will use a model which reaches farther than most funnel models do. A key concept in innovation management is – as we all know- the innovation funnel. The funnel describes the main stages and gates every idea has to pass through on its way to a product, service or business model innovation. 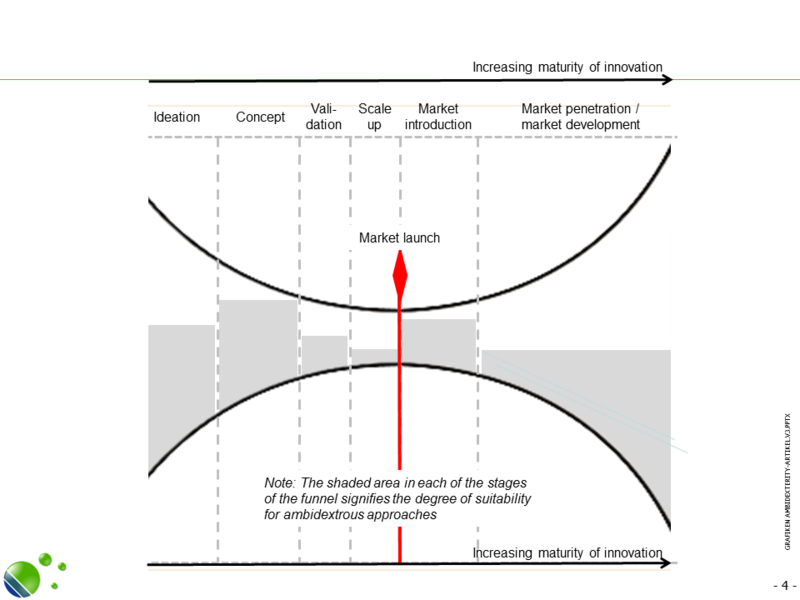 Typically, the first stage of an innovation funnel is “ideation”, the last one “market launch”. In our view, innovations are not successful just by the fact that they cleared all the stages within the funnel. The success of innovations should be measured by paying customers who re-finance direct investments made into the realization of these innovations as well as investments into the foundation that enabled them (research, systems / tools, manufacturing processes and equipment, etc.). As Geoffrey Moore  has pointed out, breakthrough innovations need to “cross the chasm” between the initial customers and the majority of the market. Actively managing the market introduction therefore increases significantly the likelihood of success for radical innovations. Ideation: Ideas for innovation in products, services and business models are generated. 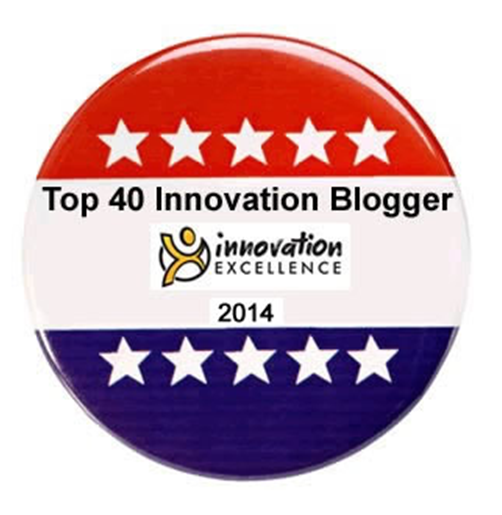 These may come from inside the company or from outside (open innovation). They may initially come from a customer insight or a technological discovery (market pull or technology push). More and more, Enterprise 2.0/Social Business platforms are becoming a critical tool for discussing, enriching and prioritizing these ideas. Concept: In the concept phase, the most promising ideas are worked out with all relevant aspects. This includes the technical features of the innovation as well as data required for initial technical and commercial feasibility checks. Usually, an artifact such as a lab sample or an initial prototype is developed for demonstrating the key features of the innovation. More and more we also see firms opening up their innovation funnel at this stage to allow for external concepts to be pulled into the innovation funnel. For the specific case of business model innovation, our improved and advanced version of the Lean Canvas has proven its value since it allows an easy entry into more general business model canvas frameworks. Validation: Concepts that pass initial feasibility tests are being thoroughly validated with respect to consumer acceptance, technological feasibility and economic viability. Usually, there are a number of iteration loops until a particular innovation concept passes all acceptance tests. Scale-up: Innovation concepts that passed the validation phase are being implemented. On the technical level, pre-production units are being built and the supply chain is being set up. On the market level, the market introduction activities including service and support are planned. Market introduction: The innovation is introduced to the marketplace. Initial customers are won and first orders are flowing in and are processed. Market development: After the innovation has achieved initial traction in the market place, systematic activities to increase the sales volume are planned and executed – depending on the industry structure, this may be done directly or in orchestration with solution and trade partners. Up so far, we have treated ambidexterity on purpose as a “monolithic” concept in order to keep the discussion streamlined. However, from the practitioner’s perspective implementing ambidexterity requires some more thinking. 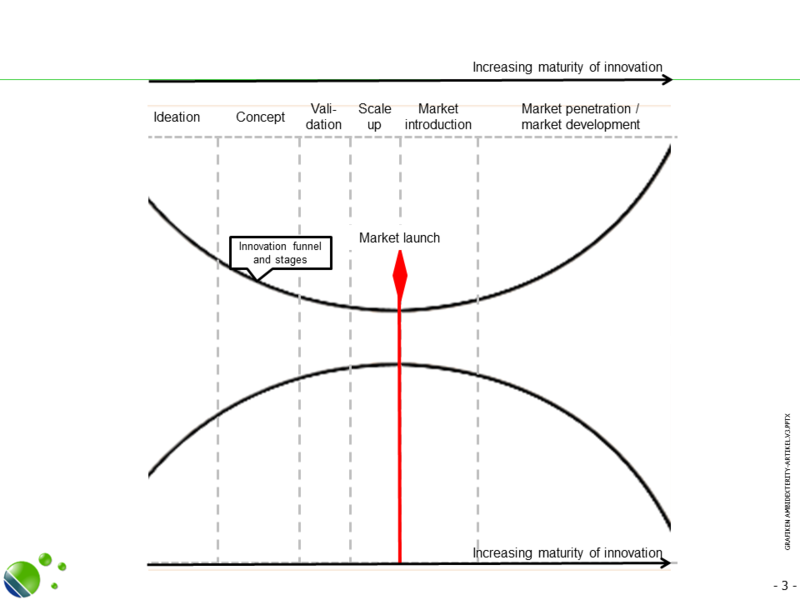 Firstly, exploration and exploitation usually refer to different time horizons, as outlined in this article about managing innovation portfolios and hence to managing a portfolio of innovation activities. Secondly, the useful amount of explorative work depends also on the stage of the (extended) innovation funnel. The appropriate amount of explorative work depends on time horizon and stage of the innovation funnel. 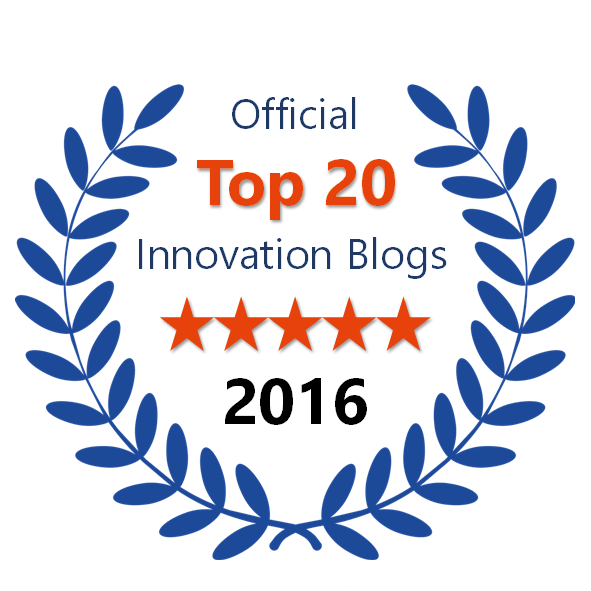 Ideation: When a firm has a strong innovation culture and a sufficiently open innovation mindset there is usually no shortage in innovation ideas. However, many firms find that the ideas generated are usually within the exploitation context and the number of radical / breakthrough ideas is rather small. In other words, for generating ideas for breakthrough innovations in products, services or business models, ambidextrous set-ups have a great value. Concept: Many firms have discovered that the day-to-day business pressure in lean and efficient organizations make it hard to conduct substantial work in fleshing out the details of breakthrough innovation concepts. In other words, ambidextrous set-ups provide a high value when it comes to turning radical / breakthrough ideas into strong concepts. Validation: Testing the innovation concepts on desirability, feasibility and viability usually requires access to existing “infrastructure” (such as lead customers, sophisticated simulation, test equipment, etc.) which is also used for exploitation. In other words, explorative set-ups – in particular when structurally separated from exploitation units – have a certain amount of value in this innovation stage but will also need to be closely linked to exploitative work. 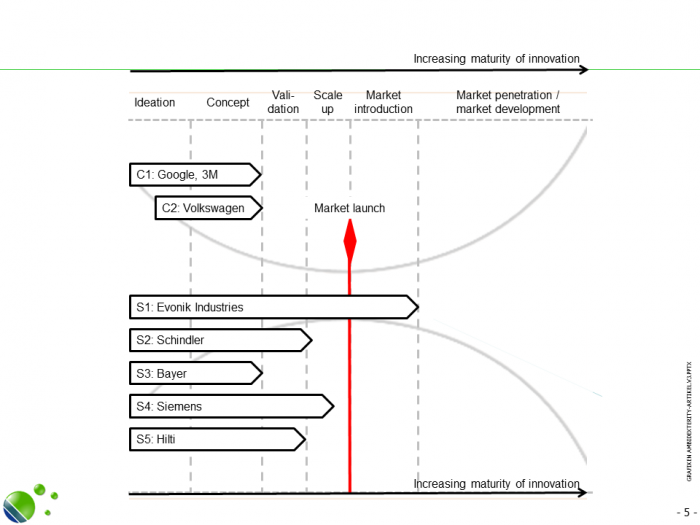 Scale-up: Preparing radical innovation for industrial production and business processes usually requires access and close coordination with existing plants, equipment and supply chain processes. Typically, these are managed by highly skilled experts that also push incremental innovations through this stage of the innovation funnel. In other words, the value of exploration-focused set-ups in this phase of the innovation funnel is limited. Market introduction: Typically, sales and customers support functions are designed for existing products – and maybe incremental innovations. At an early stage of market introduction, a lot of tacit knowledge regarding the breakthrough innovation is not fully codified and hence not accessible to sales and service staff. In other words, dedicated exploration set-ups, such as “Emerging Business Opportunity teams” with sales, support and market development tasks provide significant value for breakthrough innovations in this stage of the innovation funnel. Market development: Increasing sales volumes and market penetration require a broad and solid basis in production, sales and service processes. In other words, the more breakthrough innovation penetrates the market the more processes that drive sales, manufacturing, support and administration are embedded in the formal organization and the lower the value of ambidextrous set-ups is, particularly structural ones. Looking at these examples, we find an interesting pattern: Contextual ambidexterity is used mainly in the ideation and concept phase of the funnel whereas leading firms that want to reach far deeper into the funnel choose structural ambidexterity. There may be a number of reasons why this is the case but we think there is a paramount one. The key question is, whether the firm wants to have “just” radical ideas or concepts – or if it even aims at radical innovations (Which requires a much larger commitment). Depending on which goal is pursued, contextual or structural ambidexterity is more favorable. Research  indicates that separating explorative ventures from the core is an essential capability to incubate and grow these ventures and therefore increase likelihood of innovation success. However, structural ambidexterity comes at a higher price, so there is a trade-off decision to be made. We find nine different types of integration mechanisms. Bring in the voice of the customer: This integration mechanism focuses on the validation of an explorative idea, in particular with respect to customer acceptance and the assessment of the size of the market opportunity. In our list of examples, Evonik and Schindler are using this integration mechanism. Use outside expert commitment as an indicator: The amount of expert resources that other firms are co-investing into a joint project can also be seen as a strong indicator for the feasibility of a breakthrough innovation idea. Additionally it allows for complementing in-house expertise (Open Innovation). Evonik uses this integration mechanism frequently by setting up “Project Houses” with external partners. Build showcases: Physical artifacts that demonstrate the explorative idea can help a lot in making sure that the formal, exploitative organization understands the breakthrough idea and starts discussions about the business opportunities. In our list of examples, Bayer Material Science and Volkswagen are using this integration mechanism. Run Lighthouse projects: In some instances it might not be possible to condense the essence of a breakthrough idea into an artifact. In this case, lighthouse projects that are well communicated and hence receive a good deal of awareness help in guiding the attention and the interest of the formal, exploitative organization towards the explorative idea. In our roster of firms, Siemens is using this transition mechanism intensively. Foster internal networks and job rotation: The stronger the internal networks between the explorative and the exploitative units are, the easier it is to get a constructive discussion going. Hence supporting the build-up of internal networks – with job rotation being a major lever – is a strong integration mechanism. From our list of examples, Bayer is using this approach intensively. Educate the exploitative organization: Understanding a breakthrough idea is a necessary – but not sufficient – prerequisite for acceptance. Some firms e.g. Siemens are therefore investing a significant amount of resources in educating the exploitative organization on “what is happening out there” and on radical innovations. Provide a turn-key business: In the early stages of a breakthrough idea, the risk profile is usually very high – both with respect to the technical as well as to the market risk. Since the modus operandi of the exploitative organization is based on rather short-term goals and efficiency-based KPIs, it usually finds a number of reasons why it can’t deal with the breakthrough idea. One far-reaching solution for this dilemma is that the explorative organization provides a turn-key business. In this turn-key business, all major technical challenges have been solved and an initial market established. In our list of examples, Evonik is using this integration mechanism. Ensure management alignment: As pointed out many times in this article, there is an inherent conflict of goals and mindsets between the explorative and the exploitative organization. One way of integrating “the best of both worlds” is to establish a high-level management alignment on both exploration and exploitation. This kind of alignment aims at a holistic view on the innovation portfolio and settles targets (in particular management KPIs) and resources. Since the inherent conflict between exploration and exploitation will show up in a large number of issues, the discussion needs to be directly linked to the Top Management. Out of list of examples, Hilti is using this integration mechanism. 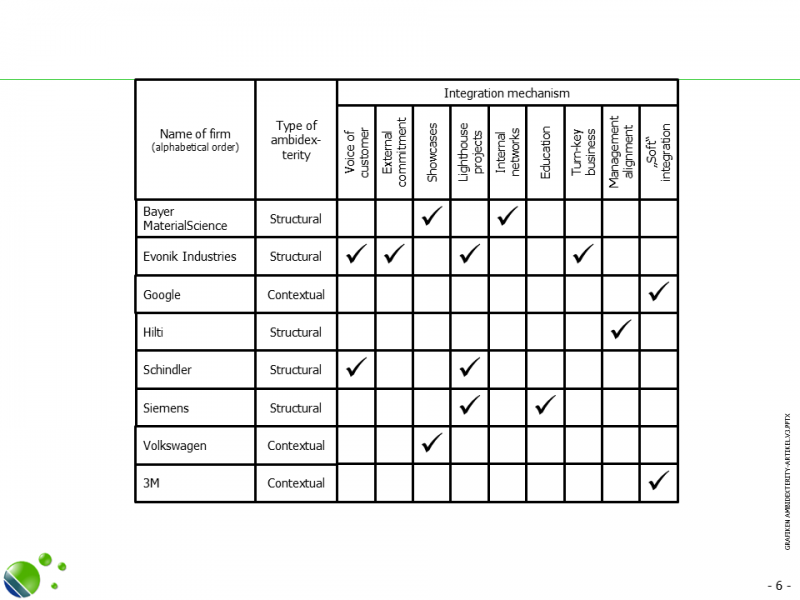 Implement “soft” integration mechanisms: Finally, a number of firms such as e.g. Google and 3M are using integration mechanisms that build on “soft factors” such as a deeply embedded mission, shared values and common beliefs. These firms show that a culture of peer evaluation and informal status levels based on quality and quantity of innovation impulses (informal meritocracy), coupled with defined management processes for discussing innovation impulses can also be an effective integration mechanism. Obviously, “soft” integration mechanisms turn out to be particularly important to drive innovation within contextual ambidexterity set-ups. Some of the firms we have portrayed focus on getting “just” radical ideas or concepts whereas others are setting their goals deeper in the innovation funnel. Probably the main reason for the choices made by these firms may be individual preferences regarding the trade-off between budgets / resources and results: Providing a contextual ambidextrous set-up that yields radical ideas is relatively cheap – whereas a structural ambidextrous set-up that aims at realizing breakthrough lighthouse projects requires more resources. Every firm has its own, individual split of budgets and resources into incremental, “adjacent markets and technologies” and breakthrough innovations. The individual split is determined by various factors, such as the firm’s innovation strategy (first-to-market, fast follower, etc.). As stated above, more explorative budget allows for larger and far-reaching ambidextrous set-ups. Quite a number of recent breakthrough innovations have a cross-industry or business model innovation character. In a contextual ambidextrous set-up it is usually more difficult to come up with a breakthrough of this kind than in a structural ambidextrous set-up. Hence if a firm sees innovation opportunities mainly in cross-industry or business model innovations it will more likely opt for a structural ambidextrous set-up. The firm’s KPI system, its culture and its processes largely depend whether a breakthrough idea or concept should be “pushed” into the exploitative organization or being “pulled” from it. An example for a “push”-integration mechanism is e.g. providing a turn-key business whereas “pull”-mechanisms comprise e.g. showcases and voice of customer. Generating a radical innovation idea and introducing it successfully to the market requires some capabilities that are not designed into an exploitative organization. These capabilities include “sensing” (what is out there? Where are untapped opportunities? ), “seizing” (taking risk, managing the fuzzy front-end), “spearheading” (driving a radical innovation and managing all known unknowns, in particular with respect to customer acceptance) and “spanning the chasm” (managing first sales successes and the critical gap between the early adopters and slower-adopting market segments). The most effective integration mechanisms also address the specific capabilities to be built up, e.g. by focusing on education (capability: “sensing”) or on management alignment (capability: spearheading). Balancing incremental and radical / breakthrough innovation is a key challenge for any firm’s innovation management. By looking at the exploitative and explorative innovation – the underlying paradigms – we found that ambidexterity is a key concept for achieving this balance. We discussed that ambidextrous set-ups have different value in the stages of the innovation funnel. We have also found that leading firms apply contextual ambidexterity mostly to identify and conceptualize breakthrough innovations, whereas structural ambidexterity is chosen if the breakthrough innovation is to be driven farther into the innovation funnel. We foresee that in the future innovation management will focus on the parallel management of breakthrough and incremental innovations – in other words, we will have two innovation funnels within one. Having arrived at this point, some key questions surface: How should the innovation budget be split between exploitative and explorative innovation? What is the optimal type of ambidexterity that a firm should apply? How should the integration between explorative and exploitative innovation be designed? And finally, how should the parallel management of the “two funnels in one” be conducted.